Supporting customers when its needed most is what we have been doing for 100 years. In 1918, New Ireland paid out £213 and 9d in claims. 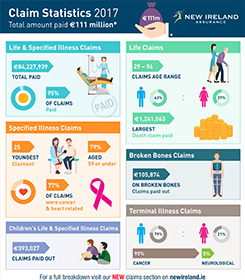 In 2017 we paid 4,434 protection claims to customers and their familes, amounting to a record €111,326,961. To see a full breakdown of these figures have a look at our Claims Brochure.